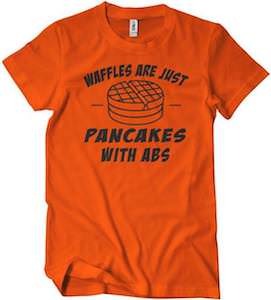 Put your food where your t-shirt is and this is what you will get. This t-shirt has such a fun graphic. 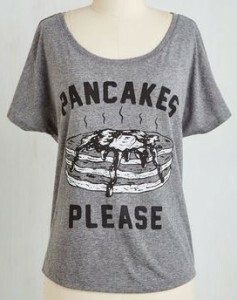 The words “Pancakes” and “Please” create a border for the picture that is going to make your stomach rumble. There is a picture of 3 pancakes stacked on top of each other, with butter and syrup oozing on the top and flowing down the sides of the pancakes. There is also some steam, so you know they are hot and fresh, ready to slide into your stomach. This 100% cotton t-shirt comes in sizes XSmall to XL. This heather grey shirt has a large scoop neck and has a loose fit. 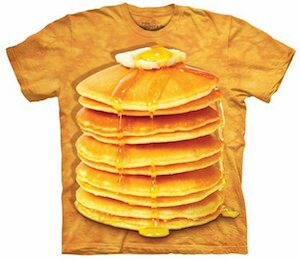 If you want to eat some pancakes then you will want the Polite Pancake Stack T-Shirt.